On 9 July 1861, six weeks after North Carolina seceded from the Union, the Confederate government asked Governor Henry T. Clark if the state could provide a place to hold prisoners of war (POWs). The 20-year-old Maxwell Chambers textile mill in Salisbury, then vacant, was hurriedly fitted for that purpose. On 9 December 120 prisoners transferred from the Raleigh State Fairgrounds were the first prisoners to enter the Salisbury Prison, the first and only Civil War prison in North Carolina. The prison population increased to about 1,400 by late May 1862, when the inmates were paroled and returned to the Union. These POWs lived in relative comfort, passing the time by making trinkets, playing baseball, and even engaging in theatrical productions. After their departure, POWs at Salisbury Prison were outnumbered by Yankee deserters and dissident Confederates. 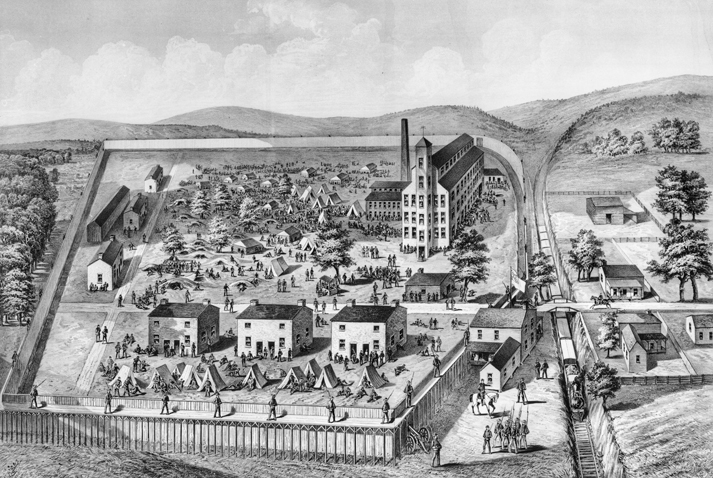 This period of "normalcy" suddenly ended in early October 1864, when 10,000 prisoners began arriving at a facility that was intended to hold only 2,500. This huge increase, which resulted from the fall of Atlanta and the ongoing siege of Richmond, made it easier for the Union army to rescue its POWs. Salisbury received some of the Richmond prisoners, and after October 1864, the majority of newly captured Union POWs. The most painful period for the Salisbury prisoners was from October 1864 until their release in February 1865. Accounts from POW diaries indicate that the prisoners took in about 1,600 calories per day, whereas 2,000 calories was considered the minimum for survival under the adverse conditions that existed at Salisbury. It is not surprising that diarrhea was the most common disease as well as the most deadly, due in large part to the overcrowding and unsanitary conditions. From December 1861, when it opened, through September 1864, Salisbury Prison experienced a 2 percent death rate (about 100 deaths). But between October 1864 and 15 February 1865, the rate soared to 28 percent. An estimated 4,000 prisoners died at the prison during its existence, for an overall death rate of 26 percent. Bodies were collected daily at the "dead house" and hauled in a one-horse wagon to trenches in a nearby "old cornfield." A visitor to the cemetery today finds these 18 trenches to be the most somber, painful, and shocking part of the Salisbury National Cemetery. The total death rate in Union and Confederate prisons is considered to have been about the same at 12 percent. In the fall of 1864 escape from Salisbury Prison was considered almost necessary to save one's life. Many POWs escaped, but only about 300 reached Union lines. During an attempted mass escape on 25 Nov. 1864, none got away and about 200 prisoners lost their lives. Tunneling became popular with the POWs. The most famous tunnel escape took place in mid-January 1865, when an estimated 100 managed to flee the prison. According to one prisoner, the easiest way to get "out of this cursed place" was to defect to the Confederacy. Although about 2,100 POWs reportedly defected, these soldiers contributed little to the Confederate cause. The morale of the prisoners was usually very low. Muggers plagued all Civil War prisons. Prisoners' diaries often mention their faith in God, and Christian services were held at the prison in the fall of 1864. Occasionally, Salisbury residents would hear the sound of a familiar hymn coming from the prison; as one citizen recalled, it was like "a thought of heaven from a field of graves." Fraternal organizations such as the Masons and Oddfellows provided some moral support for the prisoners. All POWs were transferred from Salisbury in February 1865, about six weeks before Maj. Gen. George H. Stoneman, on 12-13 Apr. 1865, destroyed the prison and other Confederate installations collectively known as the Salisbury Arsenal. In May Federal troops occupied the town, but in early September 1865 the Union commander turned over civil control of Salisbury to duly elected town officials. At the end of the war all Confederate property fell into Union hands and in September 1866 was sold at auction by the Freedmen's Bureau to the Holmes brothers for $1,600. In 1866 a U.S. military commission charged Maj. John H. Gee, commandant of the Salisbury Prison during late 1864, with murder and "violation of the laws and customs of war." After a lengthy trial, Gee was acquitted of both charges. Louis A. Brown, The Salisbury Prison: A Case Study of Confederate Military Prisons, 1861-1865 (1992). Annette Gee Ford, The Captive: Major John H. Gee, Commandant of the Confederate Prison at Salisbury, North Carolina, 1864-1865 (2000). 1 January 2006 | Brown, Louis A. Does anyone know where I can see a copy of the list of prisoners who died in Salisbury prison hospital carried north by Richardson when he escaped? I wanted to know who owns the land now and if one were able to go inside the garrison house. My great-grandfather, George W. Vanover, helped liberate the POW's at Salisbury and destroy the Arsenal. He became such a fan of Gen. Stoneman and talked about him so much after the war that he acquired, teasingly, the nickname, Old Stoneman. My great-grandfather died in 1925, hating rebels to his dying day for the way he had seen the POW's treated. An Alex Kingsmill is listed as a prisoner here in Oct. 1864, released under oath "To stay North of Ohio River". I don't believe he was a soldier, there are no military records. Wondering why he was held prisoner? Are there any other records that might show me how and why he was taken prisoner? I believe he is my 2nd Great grandfather, an Irish immigrant living in Pennsylvania in 1860 census, and 1870 census. My 2nd great grandfather T.D. My 2nd great grandfather T.D. Earls, was captured in The Siege of Vicksburg and imprisoned at Louisville Military Prison. After being released, his Oath forms says "To be released North of the Ohio river" also. Though he enlisted in Confederacy 43 B Regiment Georgia. My Great Great Grandfather William Sylvester Stevens was taken prisoner from Culpepper, Virginia. He was reported to have died there. I was wondering if there is anyway I can find if his widow got a pension. I might be able to find her information that way. Thank you for visiting NCpedia and for sharing your research question. I am forwarding the email address you included and your question to reference services at the NC Government & Heritage Library. A librarian will contact you shortly to help with your question. I'm happy to see that you take questions and that you connected someone else with an archivist to help him trace his ancestor. I, too, have an ancestor who spent time at Salisbury prison during the Civil War. I don't understand some of what is on the document. Under "Remarks" it says he was absent, missing since the Battle of Cedar Creek in VA, taken prisoner at the battle. Under "left the organization" it says (handwritten in margin M.O.R.) Died April 6, 1865 as a corporal, and under "explanation" was, "Paroled prisoner from Salisbury, NC, final statements forwarded at New York". What does M.O.R. mean? And M.R.? So, was he "paroled" meaning when he died, they considered him released? But on this website it says all POWs were released in Feb 1865, but it doesn't say to where. How can I find out how long he was in Salisbury and if he died there? Or if not, where was he released to? Out of military service? And what does final statement forwarded to New York mean? Is that his documentation of his final words, when he died, or the final military documentation? His name was Peter E Potts, he enlisted August 1862 as a private from Clermont, NY and mustered in Sept 1862 to Company I or J, Regiment 128. The document has a number stamped in the upper right "961". Can you help me find more information about his time in Salisbury, when he left, where he died?